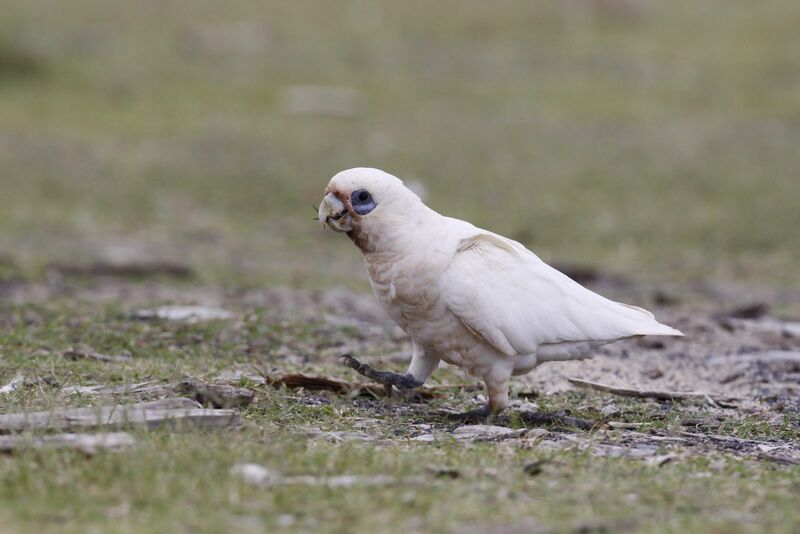 Wanstead Birder: Australia Australia Australia Australia We Love You. Amen. Australia Australia Australia Australia We Love You. Amen. All the birds in the UK are boring at the moment. Just dull Collared Flycatchers and plain old Pratincoles, which I spit at. Nothing doing in Wanstead either, despite a 5am start - oh the dedication - so instead I can get back to Australia, which is a fab country and has lots of brightly coloured birds like the one below that would get people of a twitching persuasion really rather excited should it turn up here. Having seen loads of White-cheeked Honeyeaters in Australia I wouldn't bother going for it of course. I should perhaps start with the sombre bit, which is that we were there for a funeral. I know about four people in Australia, and it came as a huge blow that one of them should have been caught up in the Victorian Bushfires. For the first few days it was just a news item, something you take a passing interest in, shrug, and move on. Bad news every day, but remote. Happens all the time, but doesn't impact me. Very selfish, but that is just the way I think we all treat news. This time it did, and what was just the news suddenly became very real, despite not really believing it. James was missing. Gradually as the picture became clearer we all began to realise he wasn't going to be found, he wasn't coming back - even James, idiot though he undoubtedly was, would have made a phonecall by now. The police found what was thought to be his body after about a week, on a remote bush track. He and his girlfriend Julie had been trying to flee Marysville, and had not made it. DNA analysis took over a month, but it was him, and so passed a unique and amazing person. 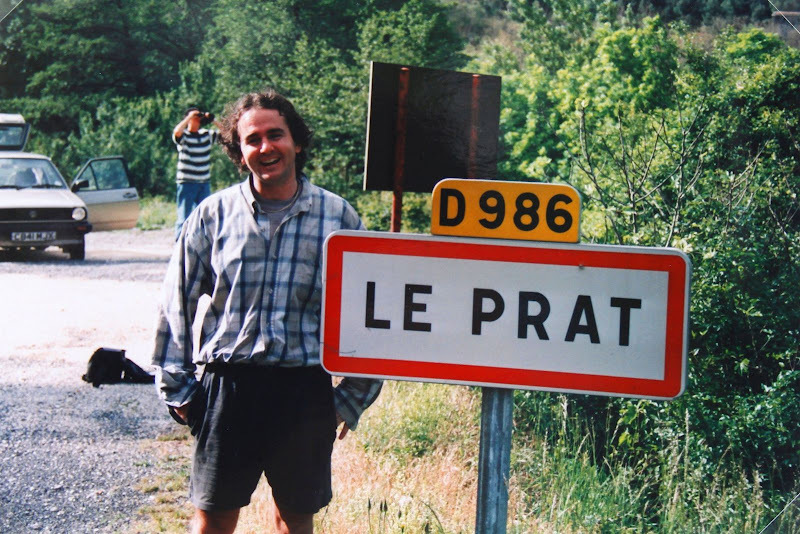 Here he is in France in about 1997, at a conveniently named village. By the time the funeral came around, enough time had passed that the initial shock and sorrow had passed. The funeral was still tough, the burial harder, but people had begun to move on, to accept what had happened, and to instead remember all the great Jimmy stories, all the anecdotes and ridiculous situations, the mannerisms and the way he spoke. And so in fact the atmosphere was more one of celebration than of mourning. When the news had sunk in, I knew I had to go, so did Bob, and we were both glad that we did, despite the distance and short duration. Byron Bay. Lots of surfers and shearwaters. Here are some. 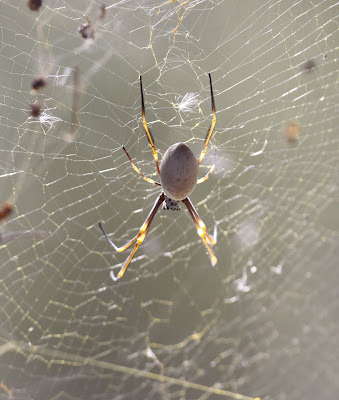 And another scary spider. We were only there for just over five days, and it rained for four of those. And not just crappy drizzley rain. Real rain. Rivers bursting their banks rain. Cars floating down the street rain. People being evacuated in boats rain. As everyone knows Australia is a land of immense contrasts, but there was a certain irony about being flooded out at at funeral for someone who died in a wildfire. Sitting here, writing this, I am puffing. I always puff when I am having a hard time, am stressed, or something is not going right. Zoe recognises the exact type of puff. Writing this post, thinking of James, has got me all in a bother. I'm still writing, but I can't concentrate on what I am actually trying to say. I was going to go on a bit about the Aboriginal elder who led the burial service, and I was going to write a bit about the small amount of birding I managed to do during rain breaks, but I'm no longer in the mood. Maybe tomorrow. Lets call this Part 1.